Hospital emergency rooms are expected to repair a blocked coronary artery in less than 90 minutes from the time the staff is initially alerted of the heart attack. It's known as door-to-balloon time. In recent years, studies have shown hospitals that treat the heart attack, known as a STEMI, in less than 60 minutes can achieve the best possible outcomes. Mission Hospital achieves a door-to-balloon time lower than both those times, with an average time of 42 minutes. That focus on constantly improving is a major reason why Mission Hospital has been recognized on IBM Watson Health's 50 Top Cardiovascular Hospitals study for the past six years in a row—and 13 times total—even as doing so becomes more difficult. Cardiovascular care overall in the U.S. has improved, so it's more challenging than ever for a hospital to be recognized as top heart facility consistently. New technology, medications and procedures are making it easier for hospitals both big and small to achieve impressive outcomes on heart treatments. “The bar is raised across all centers—it's harder,” Kuehl said. Indeed, there were a lot of newcomers on Watson Health's list this year while less than half were winners last year, too. Of the 50 hospitals, 23 were on the list last year. Thirteen hospitals are on the list for the first time. The 20th annual report analyzed performance of 1,006 hospitals using Medicare data and recognized 50 hospitals that provide better-than-average cardiovascular care. The 50 hospitals offered better treatment for heart attack and heart failure treatments, as well as coronary bypass and angioplasty surgeries. The hospitals also performed better on mortality and complications but only performed slightly better on 30-day mortality and readmissions. For instance, the 50 hospitals overall had a median 30-day readmission rate for heart attack patients that was only 0.6% better than their peer hospitals, according to the Watson Health study. "I think it really shows how hospitals overall have gotten better, so it's harder to be a lot better," said Dr. Janet Young, lead clinician in emerging analytics at IBM Watson Health. The top hospitals were divided into three categories: 15 teaching hospitals with a cardiovascular residency program, 15 teaching hospitals without such residency programs and 20 community hospitals. In previous years, only 15 community hospitals were recognized on the list, but Watson Health decided to increase the amount to "better reflect the distribution of patients to the hospitals," Young said. There are many community hospitals throughout the U.S. and they treat a significant percentage of cardiovascular patients. Mission Hospital, part of Mission Health system, which is in a deal to be acquired by HCA Healthcare, has focused on reducing door-to-balloon time below the recommended guidelines for more than 20 years. The hospital uses a digital software that allows emergency medical service technicians to send electrocardiograms to on-call emergency room doctors. Those doctors can then activate the catheterization laboratory and prepare to treat the patient when he or she arrives. Mission also has a physician whose sole job is to treat STEMIs. Leaders at the hospitals who have been on the list repeatedly over the past few years say that in order to be a top cardiovascular hospital today, it's essential to have a culture of always striving to be better. “The low-hanging fruit opportunities are gone,” said Andrea Werner, senior vice president of heart, lung and vascular services at Bellin Health in Green Bay, Wis., which has been recognized by Watson Health for the past four years and 10 in total. Bellin Health has applied that strategy to its work on readmissions for congestive heart-failure patients. In 2016, Bellin opened its heart failure clinic. Staffed with three nurse coordinators, physicians, a social worker, dietitian and pharmacist, the clinic manages patients on an ongoing basis. The goal is to understand the barriers that might prevent a patient from staying healthy as well as identifying issues that could lead to readmission. “Everyone is working at the highest level of their licensure,” Werner said. Bellin also partners with nursing homes in the community that take care of heart-failure patients to help the facilities more effectively manage them. Since the effort has been in place, Bellin has seen its heart-failure 30-day readmission rate drop from 19.5% in 2016 to 6.3% since last year. Oklahoma Heart Hospital's ability to build and sustain a culture of continuous improvement begins with its origins. The hospital is physician-owned, which CEO Dr. John Harvey believes is the reason its North Campus facility has been on the 50 Top Cardiovascular Hospital list for the past five years. “Physicians understand intuitively what it is that physicians need and want, what patients need and want and what nurses need and want, so we tend to make decisions that understand all of those things,” he said. It's easier for physicians and nurses to request changes that will improve care for patients because the boardroom is run by doctors who understand what it's like. For instance, Harvey said the Oklahoma City-based hospital was one of the first to implement a system in which the bed can weigh the patient, so the nurses no longer have to lift patients out of bed for that purpose. “It was a significant investment to put that in the bed and we did it because it was the right thing to do with our staff and we more than paid for it in reduction in workers' compensation,” he said. The fact that Oklahoma Heart Hospital is physician-owned also helps it attract and retain high-quality clinical staff, Harvey said. The hospital has a policy in which every nurse cares for no more than four patients at any given time. It also only hires nurses with at least 10 years' experience in cardiology care. The hospital has a nurse turnover rate of about 3%, which is much lower than the average turnover rate at hospitals. Similarly, Mission Hospital points to its ability to attract well-trained cardiologists for its better-than-average cardiology outcomes. Asheville, which is located in the Blue Ridge Mountains, is an attractive place to live, and is known for its scenery, nightlife and restaurants, which helps in recruiting clinical staff. Kuehl at Mission Hospital said many of the cardiologists are graduates of elite medical programs. “We have been able to attract high-quality people. They are motivated to develop programs, grow programs and be innovative. We have been lucky in that regard,” he said. Longview (Texas) Regional Hospital is pushed to provide comprehensive and advanced cardiovascular care because it's the closest major hospital for several hours. Although it's a community hospital, Longview has all the latest technology and procedures one would expect at an academic institution. “There is nothing we don't offer and that is because we have a really energetic group. We are not sending our patients hours away," said Dr. Samir Germanwala, director of endovascular therapy and transcatheter aortic valve replacements at the hospital, which is owned by Community Health Systems. All of the open-heart procedures Longview Regional has performed in the last five years are beating heart procedures, which are usually only performed at academic institutions and often not 100% of the time. 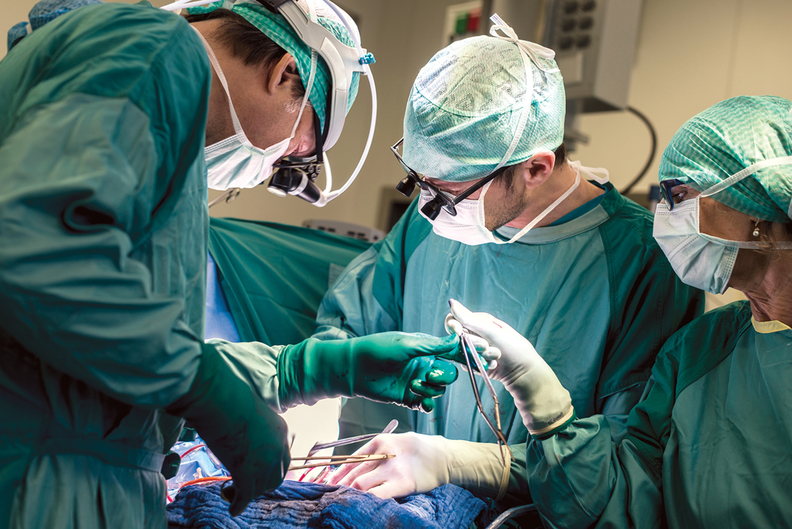 The hospital performs about 120 open-heart procedures each year. Longview has had a 0% mortality rate and 0% stroke rate for coronary artery bypass surgery every year since 2013 except for one year when it had one death. “We embrace a lot of innovation that brings down mortality,” said Dr. David Jayakar, director of cardiovascular services at Longview Regional. The hospital has been on the list for the past three years. To stay up to date on all the latest procedures and technology in cardiology, Longview physicians are involved in research and teaching engagements. “We are doing such a good job surrounding ourselves with cutting-edge people,” Germanwala said. Lack of focus on prevention? But some heart experts worry that despite all the improvement in cardiovascular disease treatment on the part of hospitals, there isn't enough being done to prevent the disease in the first place. Heart disease is the leading cause of death for men and women in the U.S. and recent statistics don't show any signs of it letting up. Diabetes and obesity, which are both major contributers to heart disease, affect large swaths of the population. “We have had remarkable technological advances in cardiology, but when you look at what makes people do better from the cardiovascular standpoint, that's only half the equation; the other is prevention,” said Dr. Karol Watson, a member of the American College of Cardiology's prevention section and leadership council and a professor of cardiology at the David Geffen School of Medicine at UCLA. The Watson Health list and others focus on how well hospitals treat patients who are already diagnosed with heart disease, but lists should also consider how well hospitals prevent the disease, said Dr. John Lee, a member of New York's American Heart Association board and assistant clinical professor of cardiology at Mount Sinai School of Medicine in New York. “I would love to see any of these rankings look at how well the prevention effort is,” he said. Correction: Longview (Texas) Regional Hospital is owned by Community Health Systems. An earlier version of this story misidentified the parent company.